Seligman, Arizona keeps growing in popularity as the destination for many travellers. Day trips (leaving Seligman during the day and returning to stay in Seligman) have become more popular. Day trips include the Grand Canyon South Rim and the Skywalk at Grand Canyon West. Keepers of the Wild is less than an hour away, and the Grand Canyon Caverns is 1/2 hour to the West. In Seligman there are clean, comfortable accommodations and a variety of restaurants in a relaxed atmosphere. Good Luck to the 72 students at Seligman High School (grades 9 through 12) as they start their 2009-2010 school year. Seligman, Arizona was founded in 1886 at the junction of the railroad from Prescott to the Santa Fe Railroad's main line. It was known as Prescott Junction until it was renamed after Jesse Seligman, a prominent New York banker responsible for financing railroad construction and companies. The railroad played a big part of Seligman's community for the next hundred years by establishing repair facilities and the famous Harvey House. Coffee saved the wedding day when Marilyn Monroe married playwright Arthur Miller in 1956. Marilyn planned to wear a cream-colored wedding gown. The day before the wedding, she discovered to her chagrin that her veil was pure white and didn't match the gown. Marilyn was no dumb blonde. She dunked her veil in strong coffee. When she married Miller the next day, the bride wore her beautiful cream gown with matching coffee-dyed veil. We invite you to join us for your favorite coffee drink at our coffee bar. Why does the U.S. flag have a five-pointed star? According to legend, when George Washington asked Betsy Ross to sew the country's flag, the sketch that he showed her had a flag with 6-pointed stars. Betsy convinced him that 5-pointed stars were better because she was able to fold a piece of cloth in a way that resulted in a perfect 5-point star with a single snip of the scissors. Betsy died on January 30, 1836, at the age of 84. Old Glory is one of the most complicated flags in the world, requiring 64 pieces of fabric to make. It's also changed designs more than any other flag in the world. The American Legion Post 123 meets the third Saturday of the month in Seligman at 3:00P.M. This article was submitted by John McEnulty. Colorado River at the bottom of The Grand Canyon every day. If you live to be 100, you'll never forget this day. Call 1-800-716-9389 for information. Some people really know how to travel Route 66 in style. That is what Mike Snodgrass & Debbie Albrech are doing. This congenial and easygoing team left Tulsa on August 20th, 2008 with a West Coast destination. Travelling 15 to 20 miles a day with three horses named Angel, Spot and Dodger (one used as a pack horse which is rotated every day), they passed through Seligman on August 12th, almost one year since they left Tulsa. "If you can do it, DO IT", said Mike as he sat on a hay bale in front of Historic Seligman Sundries. Personally, Mike and Debbie wanted to prove that they could do it. They spend 2 hours each morning and evening feeding and caring for the well-maintained horses. Each horse requires about 25 gallons of water a day, and Mike shoes the horses every 20 to 25 days. Mike does some cowboying along the way, just taking the trip one day at a time. They find many people that they meet curious and also helpful. Oh, by the way, in the saddle with Mike is their ranch dog. "Bob is her name, " said Mike. For larger images go to photos.route66patriot.com. Here's a story of a family vacation that included taking a tour of Historic Route 66, rafting down the Colorado River, and visiting a town where your name is prominently displayed. That is what Randy, Elliot, Olivia and Audrey Seligman did the first week of August. The New York family from Chappaqua, New York walked into The Historic Seligman Sundries, proudly stating that their surname is SELIGMAN. This was the family's first visit toSeligman, Arizona. Elliot is a psychologist, and Randy is a professional photographer in New York. Our visit with this charming family made for a very pleasant experience. Forty three years ago Elliott and three friends drove through Seligman in the summer in their VW Bug. Remember - no air conditioning (it was summer). Cozy?? "Don't wait another forty years!!" exclaimed Elliot. According to Elliot, " I love the town and am proud to share the name". On Saturday September 19th plan on attending the classic car show hosted by The Seligman Chamber of Commerce. 5 Judged Categories - Slow Drag (cars only please) - Chili CookOff - Poker Walk - Horse Shoe Tournament - Kids Games - 50/50 Raffle - Food, Fun and Music. This event will be held in The Road Kill parking lot starting at 10:00 AM . Do you want to go on a tour, go camping, have social interaction with your fellow travelers, and forego the normal comforts associated with travelling? If the answer is yes to all of these, then you want to join a Rotel Tour. We have had the pleasure of meeting Martina as she escorted her German tourists on her 16-day tour of the Southwest. Los Angeles, San Francisco, Yosemite, Las Vegas, Bryce Canyon, The Grand Canyon, and of course, Seligman on Historic Route 66 were some of the highlights of the tour. This unique company, which has been operating tours for over 50 years, offers tours in 130 countries. There are accommodations for 23 people to live on the bus. The passengers also are served breakfast and dinner. On this particular tour, Joseph is the driver, mechanic, and chef. He definitely is a genuine multi-tasker!! Heidi, a seasoned traveler, was relaxing in front of the store drinking her cappuccino when she told us that this was her 15th tour. She is 66 years old and travelling Route 66 on her 5th trip to The United States. She said, "I like it all, especially the friendliness of Americans." From Martina, the guide: "Wir sind Hier Gerne Unterwegs!" " Wonderful trip on Route 66 and a fantastic city: Seligman"
We would like to recognize Seligman's American Legion for the community service they provide. One of the major contributions to the community is the weekly distribution of food from their food bank which averages 66 families in the Seligman and Ashfork communities. Volunteers pick up food from Prescott Valley and Flagstaff at their own expense weekly to distribute food at The American Legion. Theirs is quite a charitable endeavor. The American Legion also collected a sizeable donation for Corporal Tyrell Manakaja from Seligman who was is recuperating in the hospital from injuries he recieved while serving in Iraq. Commander Joseph Kanakiewicz has also initiated a program to distribute drug awareness pamphlets to Seligman High School. A hearty thanks to Joe for his charitable contibutions to the community! "The people in Seligman, Arizona make it the best town on Route 66". This is a quote from Dirk Goetz from Barcelona, Spain. This enthusiastic gentleman spent a night in Seligman to capture some of the local flavor and photos for his travel documentary about Route 66. His 4-week journey throughout the Southwest is something that he thinks everyone should do once in a lifetime. Dirk is an actor, photographer and businessman in Barcelona who enjoyed his stay in "The Elvis Room" at The Canyon Lodge in Seligman. We look forward to viewing his photos and comments about Seligman. "Animo a todo el mundo a experimentar por una vez en la vida este viaje. Sin lujar a dudas sereis mejores personas." Three years ago, Kota from Yokosuska, Japan travelled Route 66 through Seligman. Kota had the large Route 66 flag that he is holding in the photo signed at all of his stops. This Route 66 fan married Hitomi in Yokaham, Japan on August 8th of this year. Their honeymoon is a journey down Route 66. The large Route 66 flag that Hitomi is holding is the new flag being signed as they travel The Route together on their 10-day journey. Kota is a Second Mate Navigation Officer on an oil tanker. From Kota,. "Good day, we have many happy miles on Route 66. Our honeymoon is happy". "Konnichiha. Hanemun de kimashito. route 66 ha seiko - desu. Zehi minas anmo kite kudasaine!!" Find it in many fine establishments along Route 66. One of the many attractions within a short driving distance from Seligman is Keepers of the Wild. "Keepers of the Wild is more than just tigers and other big cats. With more than 150 animals, there is something here for everyone. Jo-Jo, our spider monkey, is just one of 15 primates that make their home here. Come check us out! Walk the park at your own leisure or take one of our guided Safari Tours offered four times daily." Destination - Seligman, Arizona on Route 66. There are many attractions within a few hours of Seligman and more travellers are selecting Seligman as a base for day trips. In this issue we highlight a few of the attractions that are a short drive from Seligman. We have included a few articles about some of our visitors this past month. Many of our Seligman visitors' photos can be viewed on www.seligmansundries.com (Seligman Sundries). Enjoy another dedicated photo album titled photos.route66patriot.com. We always welcome articles for our newsletter. The Historic Seligman Sundries www.seligmansundries.com welcomed a great group of riders from Barcelona, Spain. Thanks for stopping by, Victor. Algunos fragmentos del viaje organizado por la Agencia de Viajes Española AVENTURISMO junto con el Chapter Barcelona y Star Riders Spain por la Route 66 en Harley Davidson. El tour tenía una duración de 8 días, tenía inicio en Los Angeles y se recorría parte de la Route 66, los parques Nacionales de Grand Canyon, Bryce Canyon, Las Vegas y el Desierto de Mojave. Se realizaron 3 grupos con un total de más de 200 motos. "How many tigers can fit into one tub? Millie seems to see there is room for one more! Come see how our "Tigers of the Tub" are beating the heat this summer! " Bach wrote his Kaffee-Kantate, or Coffee Cantata, in response to an anti-coffee movement in Germany. In the eighteenth century, experts claimed that coffee caused sterility in women, and was harmful to young people and generally bad for one's health. Artists responded with biting satirical works. Best known for his uplifting church compositions, Bach flexed his funny bone for the Kaffee-Kantate. A father tries to convince his stubborn teenage daughter, Lieschen, to kick the coffee habit. The girl insists that without coffee, she'll dry up like a roasted goat. "Ah! How sweet coffee tastes," she cries. "Lovelier than a thousand kisses, sweeter far than muscatel wine! I must have my coffee! "Good taste prevailed, and the afternoon ritual of coffee and cake (Kaffee und Kuchen) is still an important part of German culture today. Where were you on June 20th 1969? 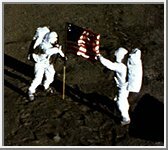 The deployment of the flag of the United States on the surface of the Moon is captured on film during the first Apollo 11 lunar landing mission. Here, astronaut Neil A. Armstrong, commander, stands on the left at the flag's staff. Astronaut Edwin E. Aldrin, Jr., lunar module pilot, is also pictured. The picture was taken from film exposed by the 16mm Data Acquisition Camera (DAC) which was mounted in the Lunar Module (LM). While astronauts Armstrong and Aldrin descended in the Lunar Module (LM) "Eagle" to explore the Sea of Tranquility region of the Moon, astronaut Michael Collins, command module pilot, remained with the Command and Service Modules (CSM) "Columbia" in lunar-orbit. My friend Hilda took her adult children for a vacation at Grand Canyon Caverns. The thing they especially wanted to do was go horseback riding. I told them to be prepared for great riding over a large property with a forest and several 360 degree view mesa locations. Enough said, I thought. They are city folks and came back raving about their outing. They said I didn't explain how big 1,400 acres is with another million acres across the road (Route 66). Hilda says it's important to know that you ride cross country, not in a dusty line on an overused horse trail. Birds and small animals are everywhere with occassional elk sightings, too. Our land has not been logged since 1940, so we have a beautiful forest to ride in with a huge variety of plant life. There's no removal of trees or plants on this "No Hunting" property so you really see nature at work undisturbed. There is great hunting nearby. Hilda and I both agree the sunset ride is as close to the "Old West" as most of us will ever get. Our wonderful cowboy family matches each person to the right horse and joins in for safe and guided trips to unique corners of our Grand Canyon Cavernsworld. There are also half hour, hour, two hour and half day rides...We'll invent a ride that suits you...at a price city horse back rides have not seen in more than a decade. No, not Willie Nelson - we're talking about Bill and Kathy Maier from Guthrie,Oklahoma. Look for the bright red, spotless 2007 Freightliner adorned with Route 66 plates and decals, travelling Route 66. Seligman, Arizona is their favorite stop. About three times a month we see Bill and Kathy on their trips from Oklahoma to San Francisco. Bill travels as much of Route 66 as he can with the one definite stretch - Seligman to Kingman - being his favorite. Bill spent his boyhood in the Route 66 town of Edmond, Oklahoma. He especially remembers the "Wide Awake Cafe". After 26 years in radio in Oklahoma City and also owning a diner in Guthrie, Oklahoma, in 1990 he hit the road. During the past year, Kathy, his wife of 39 years, has been able to share his adventures travelling with him. Although they travel about 3,700 miles a week, they scheduled their trip to stay in Seligman (see photos of Elvis room - Canyon Lodge) and be in our Seligman Days parade on July 18th. What an attraction and significance having him roll through town with us since Route 66 represents the transportion of commerce. When you see Bill on The Road, encourage him to sound his horn if you are not in a town with a noise ordinance. You'll think a freight train is coming down the road! On July 19th, another Seligman gentleman visited us. While attending the Williams, Arizona Hamfest, Jeffrey drove the 45 minutes to see his name "Seligman" on signs all over town. An engineer/computer consultant for Microsoft in Tucson, Jeffrey shared some of the details of his Bavarian heritage with us during his visit to our store. As far as Jeffrey knows, he is the only Seligman living in Arizona. He started the Radio Society of Tucson in 1993 and is now a P.H.D. candidate at The University of Arizona. Call him at K2VNT. The local event "Seligman Days" was July 17th and 18th. Pictured here is our entry in the parade held on the 18th, Tow Later (1948 Ford Tow Truck ) hauling our 1955 Chevy Wagon. This year there have been many visitors from The Czech Republic. We have proudly displayed the signed flag from these two happy travelers. Thanks! Many visitors from Czech Republic are impressed by the fact that Arizona is 295,254 square kilometers (113,998 square miles) and Czech Republic is 79,000 square kilometers. Despite the fact that Arizona is four times the size of Czech Republic, the population of Czech Republic is 10.3 million and the population of Arizona is 6.5 million with one third of that population in the Phoenix metropolitan area. The population estimate of Seligman is 500 residents in town and about 1,000 total within a 25-mile radius. Takove misto plne pohody a sympatickych lidi neni nikde jinde na svete. Jsme nadseni!!! Dekujeme a prejeme stesti. From Czech Republic - Alexandr Gurlich - July 22, 2009. Barisciano, a small village in the Italian region of Abruzzo, was heavily affected by the earthquake of past the 6th of April. The local church went seriously damaged too. The people of the village do not have a place of worship where they can pray in this moment of terrible sufferance. Goal of "Route 66 for Abruzzo" is to raise funds to allow the Alpinis to start the construction of a new church. The project of the new building will be made and donated by Bianca Maria Ceriello, architect, as well as member of the committee. On the 11th of July, Alessandro and Xavier, the two riders of the association, departed for a 4,000 kilometers trip along the Historic Route 66 in the U.S.A. Along the road they will meet groups of riders and associations who will support us in this initiative. Every day they will narrate their trip in the website and the blog with pictures, videos and articles. In this way they will allow the community to virtually travel with them. To everybody who will follow them in this special journey, they will offer a true story of an adventure 4,000 km long and populated by all the people encountered along the way. Neighbors To The North - Eh! Shawn, Deanna, Sydney and Allysa from Edson, Canada included Seligman in their travels this year. Staying at the Seligman KOA campground for three days in July, they used Seligman as their base for day trips which included the Grand Canyon. We enjoyed seeing their smiling faces as they shared their good experiences while exploring our corner of Arizona. They usually take a trip to visit their southern neighbor once a year. We wish them a safe journey and thank them for letting us be a part of their Seligman experience. Destination - Seligman, Arizona on Route 66. More tourists are choosing Seligman as a destination because of our comfortable accommodations, good choices for meals, and friendly people. July 4th - Flag Raising at the flagpole in the center of town at 8am. Go to www.route66patriot.com "Route 66 Patriot" for more information and photos of past events. Seligman Days - July 18th and 19th. Join the parade, softball tournament and family activities throughout town. Along with a feature story about Norberto De Angelis travelling by handbike from Chicago to Los Angeles, we had the opportunity to meet Keela Carr who is walking from Los Angeles to Chicago to support and say thanks to all of the military troops serving in the Armed Forces. Her story is detailed on her website www.athousandthanks.us (A Thousand Thanks). Thanks for stopping by, Keela. Many of our Seligman visitors' photos can be viewed on www.seligmansundries.com (Seligman Sundries). Also, we always welcome articles for our newsletter. Thanks for the support. "Seligman is like coming home". This is a comment from a frequent visitor and good friend to Seligman, Hermann Reuther from Germany. Recently Hermann was leading one of his unforgettable adventure tours from Chicago to Los Angeles on a Harley-Davidson motorcycle and took time to talk with us during his stop in Seligman. According to Hermann, Seligman is the town everyone is searching for... the town where time stands still. The main reasons Hermann looks forward to his "Seligman experience" are the friendly people, clean accommodations and good food. Precisely at 7:00am on June 20th the roar of Harley engines started and his eager group departed from The Canyon Lodge www.route66canyonlodge.com on their way to Westside Lilo's for breakfast before heading out on the last part of their journey to Los Angeles. The first coffee shop opened in 1475. The Arabs brought coffee back to the Middle East. By 1100 AD, they had learned to cultivate coffee plants, and brewed a thick, bitter beverage by roasting and then boiling the seeds. The Arabs named their beverage "qahwa". Coffee consumption spread to India, Greece and Turkey. The world's first coffee shop, Kiva Han, opened in Constantinople in 1475. At that time, a Turkish woman could legally divorce her husband if he failed to provide her with the proper quota of coffee. When Alaska and Hawaii were being considered for statehood in the 1950s, more than 1,500 designs were spontaneously submitted to President Dwight D Eisenhower. Although some of them were 49-star versions, the vast majority were 50-star proposals. At least three, and probably more, of these designs were identical to the present design of the 50-star flag. At the time, credit was given by the executive department to the United States Army Institute of Heraldry for the design. Of these proposals, one created by 18-year old Robert G. Heft in 1958 as a school project has received the most publicity. His mother was a seamstress, but refused to do any of the work for him. He originally received a B- for the project. After discussing the grade with his teacher, it was agreed (somewhat jokingly) that if the flag was accepted by Congress, the grade would be reconsidered. Heft's flag design was chosen and adopted by presidential proclamation after Alaska and before Hawaii was admitted into the union in 1959. He got an A. One more reason to make Seligman, Arizona your travel destination. Want a Taste of the Old West? Norberto - translated means "distinguished for his strength". That accurately describes Norberto De Angelis, the 45-year old Italian athlete completing his journey on Route 66 by handbike. In 1992, Norberto was in a life-changing accident leaving him in a wheelchair. This inspritional, former American-style Italian football player rose to his challenge of being disabled to become an inspiration for all disabled people. On June 28th we met Norberto as he was travelling from Chicago to Los Angeles by handbike. The smiling, confident Norberto launched Progetto 6 six (project Route 66) two months ago. Roberto is a true Italian hero and someone who needs to be saluted. We feel privileged to have met him! www.norbertodeangelis.com details Norberto's journey and is a truly inspirational story.
" Agli amici Lynne and Frank. Un sincereo saluto e grazie per l'ospitalita" #99 - Norberto De Angelis. "Germans are Tough", that is Martin Ohlendorf, The Berlin athlete passing through Seligman on his 10-week journey from Calgary to Key West by bicycle. Halfway through his journey - on schedule at five weeks - we met Martin, the 34-year old who is travelling over 5,000 miles (8596 km). According to Martin, he not only enjoys the challenge but also the interaction and encouragement from people he has met along the way. Martin is a veteran of several Iron Man competitions. Good luck, Martin! Frank Fara and his wife, Patty Parker, have released another hit album. Frank's songs capture our imagination and catapults us back in time to some of our most defining moments in the history of the American West. We look forward to another visit by Frank and Patty when they visit Seligman on Route 66. Visit: www.frankfara.com to find out more about Frank and Patty and their music. "Hier moet je zeker naar toe gaar en koffie drinken." dela med dig av dina foton. Seligman continues to be the destination for many Route 66 enthusiasts. We welcome the re-opening of the village of Supai which has been closed since last summer's flood. Much work went into cleanup and repair to open for this summer's tourist season. The Brothers of The Third Wheel were in Seligman for the Memorial Day Holiday weekend (May 25th). We enjoyed their company and also their traditional evening light parade. Next year will be their 15th anniversary to return to Seligman for the Memorial Day weekend. On June 27th, The Desert Road Riders Motorcycle Club from Bullhead City will host their 16th annual Great Escape Rally in Seligman. For details, visit www.desertroadriders.com. Memorial Day in Seligman was highlighted by a flag-raising tribute to military personnel. We were honored to have Navajo Code Talker Sam Tsosie Sr. as our special guest. Navajo Code Talkers participated in numerous battles in the Pacific, including Guadalcanal, Iwo Jima, Peleliu and Tarawa. Photos and highlights of the Memorial Day ceremony can be viewed on www.route66patriot.com. Congratulations to the 11 graduating seniors from Seligman High School! We appreciate your support and enthusiasm for our Memorial Day tribute. So many of you helped unselfishly. The efforts of many and the participation of Seligman residents enabled us to have a fitting tribute to all veterans. Navajo Code Talker Sam Tsosie Sr. was our honored guest. View photos and a description of the ceremony on www.route66patriot.com. Travelers visit Seligman for many reasons. Some are on their way east to the Grand Canyon, others are heading westward to Las Vegas, but everyone considers Seligman a nostalgic stop on Route 66. Seligman is also a special destination for some people. Just ask Bob and Beverly Seligman from Cheyenne, Wyoming. For several months, Bob finalized plans to marry Beverly in Seligman, the unique town that bears the same name as his family. On May 15, 2009, Bob and Beverly were married at the Seligman Justice Court. They extended their stay in Seligman from 2 to 4 days to fully experience our town. They told us that their stay at The Canyon Lodge www.route66canyonlodge.com was memorable. Best Wishes to the Seligmans!! It is estimated that coffee originated in an Ethiopian province called Kaffa. But, there is controversy about where it originated. Coffee first became trendy in Arabia during the 13th century. Coffee trees were grown in India sometime after 1600, and some around 1650 coffee was imported in to England and coffee houses opened in London and Oxford. Coffee was popular by the 18th century in Europe and European colonists introduced the crop to other tropical countries to help them supply a healthy domestic demand. The demand for coffee was so strong in the 19th century that when authentic coffee beans were limited, people developed substitutes from vegetables like, chicory root, acorns and figs. The flag is usually displayed from sunrise to sunset in the open. It should be raised briskly and lowered ceremoniously. It is displayed daily, weather permitting, and especially on certain holidays, on or near the main administration buildings of all public institutions. It is also displayed in or near every polling place on election days and in or near every schoolhouse during school days. Situated along a pristine section of Historic Route 66 is Keepers of the Wild Nature Park, an exotic animal sanctuary that offers walks on the wildside six days a week! Dedicated to the protection and preservation of all animals, Keepers of the Wild provides lifetime care for unwanted, abused, neglected, and retired animals of all shapes and sizes. Experience close encounters with more than 150 animals as you leisurely stroll alongside lions, tigers, mountain lions, and wolves (just to name a few.) Take one of the guided Safari Tours to learn more about the animals and watch them feed. Bring your lunch and have a picnic by the Serengetti. Located at 13441 Highway 66 in Valentine, Arizona, the park is open Wednesday through Monday (closed Tuesdays.) For more information, please visit their website at http://www.keepersofthewild.org/ or call 928-769-1800. Root beer, the original American soft drink, is only 100 years younger than the nation itself. Root beer has a long and eventful history that coincides with the development of American popular culture. Root beer was first manufactured in Philadelphia in 1866. Prior to this, farm people of the 18th and 19th centuries had been making some sort of elementary root beer. In 1876, root beer made its debut at the U.S. Centennial Exposition in Philadelphia along with Alexander Graham Bell's telephone, the Remington typewriter and Heinz Ketchup. There is only one original Route 66 "Route" Beer bottled in the USA under the authority of Route 66 Sodas, LLC. Ask your favorite retailer for this product. The root beer's award winning taste and the souvenir bottle with a twist-off cap is a collector's item. Call us at 928-853-0051 if you need assistance finding a retailer in your location. May has arrived and the weather in Seligman is ideal for outdoor activities. As always we invite you to consider Seligman as your destination. Our friendly town is wating to provide you with a comfortable stay in a relaxing atmosphere. We want to thank everyone for the response to our newsletter. This past month most of our foreign tourists have been from Germany, Belgium, Switzerland, and France. We have added some of their photos on our website www.seligmansundries.com . We invite you to join us in our tribute to Military personnel from Seligman, Arizona. On a rainy and cold Saturday in April we were visited by the lively group of Germans led by Hans and Angie Mantler. We enjoyed their company and enthusiasm despite adverse weather conditions. They started out from Bike Week in Orlando, Florida and were heading to the west coast by way of Las Vegas. Coffee represents 71% of all the United States caffeine consumption. When coffee first appeared in Africa, it was used as a type of religious intoxicant. Americans' taste for coffee grew during the early nineteenth century, as a result of tea imports being cut off due to the War of 1812. After many of our visitors have soaked up the sights in Seligman they are ready to head to Las Vegas. At the mid point from Seligman to Las Vegas (about a three hour trip from Seligman to Las Vegas) is a quaint, quirky and cool town called Chloride. Chloride is just four miles off Highway 93 in northwest Arizona. It is the oldest continuosly inhabited mining town in the state. At one time 2,500 people and over 70 silver and lead mines once prospered. Now about 400 folks call this living ghost town home. The Black Cat Bar is one of Northern Arizona's most storied institutions. This famous cowboy hangout, situated directly on Historic Route 66 in the middle of the town of Seligman, boasts of the 4th oldest liquor license in the state. The nostalgia of the Black Cat dates back to the heyday of the railroad and the huge surrounding cattle ranches. On any given day you'll find tourists, local folks, and even cowboys from surrounding ranches, gathered to partake of a cold beer or favorite drink, play a friendly game of pool, or just hang out. Often you'll find a lively country band playing, with the tables pushed back so folks can enjoy dancing and just having a good time. This is also the place where the town folk get together once a month to celebrate all the birthdays and anniversaries for that month. The Black Cat is also actively involved in many community activities, and hosts the Predator Hunt each spring and supports the Route 66 Fun Run Car Rally each May, Seligman Days, the annual Chicken Fry, and other events throughout the year. Anyone passing through the town of Seligman shouldn't miss the opportunity to stop and visit this friendly, beloved Black Cat Bar! Be sure to stop in if you have the opportunity! The Black Cat is across the street from The Historic Seligman Sundries. We enjoyed having you visit The Historic Seligman Sundries. We strive to make your stop enjoyable. We invite you to stop in again. We offer espresso, gourmet coffee, a wide selection of gifts and clean restrooms. This email was sent by Historic Seligman Sundries, 22405 W. Historic Route 66, PO BOX 1392, Seligman, Arizona 86337, using Express Email Marketing. You were added to this list as kungstorgsraggarnagbg@hotmail.com on 5/16/2009.